2005 - Decorations are once again awarded, after 23 years. Chief of the General Staff, Lieutenant General Moshe Yaalon granted awards Tuesday, the 12/4/05, at the IDF auditorium located at the command and staff base in Glilot. The ceremony was held in the presence of major generals from the general staff forum and division and brigade commanders representing those who received the awards and commendations. During the ceremony, personal commendations and awards for superiority, courage, and bravery were given. The Medal of Courage, the second most noteworthy medal was granted to Superintendent Y. "on combat leadership, courage, sensitivity and devotion to his missions. Superintendent Y. led his command in the current ongoing war, from operation to operation by volunteering for every mission. He led his unit with courage and dedication under difficult fighting conditions and implemented as part of his conduct and customs exercises and fighting methods which should be emulated and adopted by all." 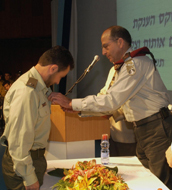 A Distinguished Service Medal was awarded to the 'Givati' reconnaissance battalion, for the continuous and ongoing operations conducted in 2004 in the Gaza Strip. The reconnaissance battalion has carried out many operations under difficult and complex combat conditions. They also developed many unique combat methods which were implemented in different combat operations in villages and urban regions. Read more on this decoration. The Chief Of Staff Citation was awarded to the 'Egoz' battalion and 'Duvdevan' unit for their operations in 2004. According to the IDF, "in many of their operations the 'Egoz' battalion has made many fascinating achievements and shared the lessons they learned with other combat units participating in the missions. The 'Duvdevan' unit carried out numerous operations in difficult and complex combat conditions in order to arrest wanted terrorists and to prevent suicide attacks. In these operations they showed high standards in the way they operate. They have developed a vast knowledge on operations and achieved astonishing results."